After 18 months that have been among the most traumatic in Argentina's turbulent history, life in Buenos Aires has finally regained an air of normality. There is a new president, Néstor Kirchner, and a new mood of optimism, and their arrival coincides with the onset today of the Southern Hemisphere winter, which traditionally means a surge in activities in the sophisticated, elegant city that once prided itself on being "the Paris of South America." 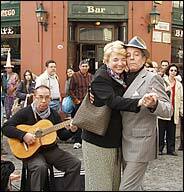 A tourist tangos with a professional dancer. So have the scenes of violent street disturbances and food riots that filled television screens and newspapers around the world late in 2001, when the crisis erupted. Tempers have gradually been soothed as an economic recovery and political renewal gain strenth. The capital today is one of the cleanest, safest and calmest cities in the Western Hemisphere, its broad boulevards and imposing buildings in regal French neo-Classical style restored to their former life and grandeur. 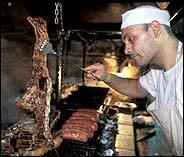 A typical parrilla, or grill. It is hard to be closer to the center of things in Buenos Aires than the Hotel Crowne Plaza Panamericano, at Avenida Carlos Pellegrini 551; (54-11) 4348-5000, fax (54-11) 4348-5250; www.crowneplaza.com.ar. Many of the 385 rooms, with wood floors and a pastel color scheme, overlook either the Teatro Colón or the towering obelisk that is the city's most famous landmark, and just a block away is Calle Lavalle and its mall filled with restaurants, theaters and shops offering leather goods, sweaters and shoes at bargain prices. Doubles from $150. Budget: Not only is the Hotel Castelar, Avenida de Mayo 1152, (54-11) 4383-5008, fax (54-11) 4383-8388, www.castelarhotel.com.ar, conveniently located on a main thoroughfare midway between the presidential palace and the Congress building, but guests have the right to use the accompanying Turkish baths and spa. The 160 rooms, often small, are simply furnished, but at less than $50 a night, it's hard to complain. 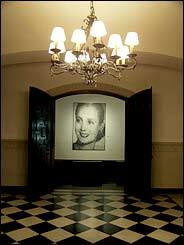 Luxury: When kings and emperors visit Argentina, they invariably end up at the Alvear Palace Hotel, at Avenida Alvear 1891 in the fashionable Recoleta district; (54-11) 4804--7777, fax (54-11) 4804-9246; www.alvearpalace.com. The accent here is on luxury, with butlers on every floor and many of the 214 rooms decorated in classic French style. Prices, of course, reflect the surroundings, with doubles from $348. The Four Seasons Hotel, at Posadas 1086, is in a neighborhood of mansions at the end of Avenida 9 de Julio, (54-11) 4321-1200, fax (54-11) 4321-1201, www.fourseasons.com/buenosaires, and its exterior is as impressive as any of the buildings around it. Tasteful paintings and furniture give the public spaces inside a subdued elegance, and the 165 modern rooms have all the amenities one would expect in a five-star setting. Doubles begin at $300. LARRY ROHTER is the chief of the Rio de Janeiro bureau of The Times.